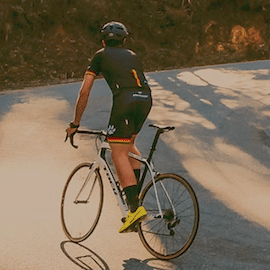 Whether it be bitumen or dirt tracks that tickle your riding fancy, you will love the many great cycling tracks, roads and trails on offer. 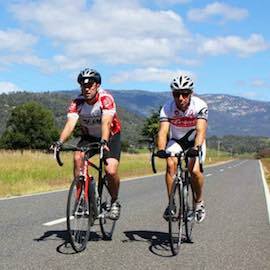 Tallangatta is home to part of the High Country Rail Trail. The trail hugs the shoreline of Lake Hume from Wodonga to Old Tallangatta and then continues on the Cudgewa line to Corryong. The original railway line was built in 1887 and was used to transport material for the Snowy Mountain Scheme. The last train headed out along the track in 1978. 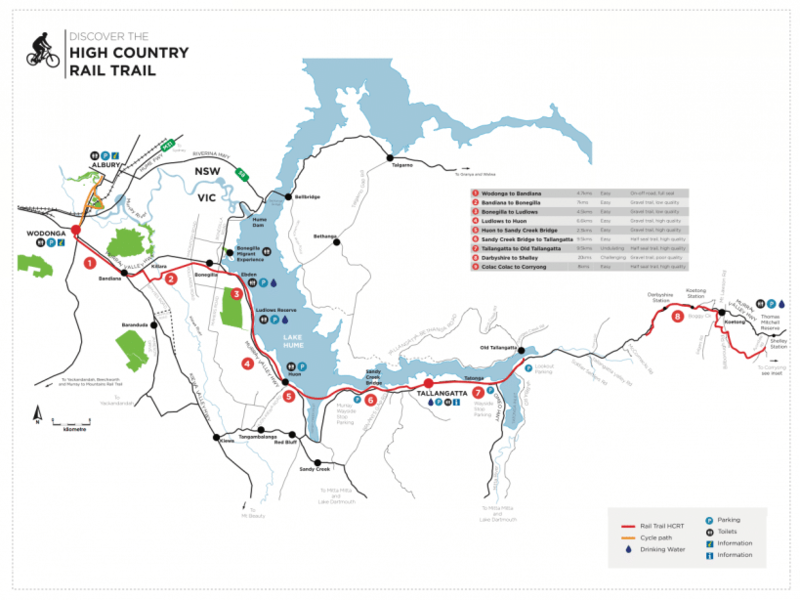 The scenic High Country Rail Trail takes in magnificent lake and mountain views, with railway and immigration history available along the way via interpretive signage. 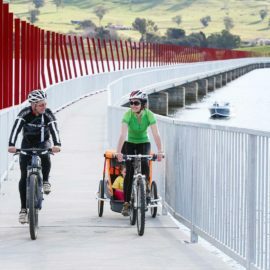 There are magnificent mountain views, historical sites and the cool waters of Lake Hume to enjoy along the 35 kilometres of trail between Wodonga and Old Tallangatta. From Old Tallangatta to Corryong the trail is 74 kilometres and takes in pine plantations, State Forest and mountain views. The trail between Old Tallangatta and Corryong is being developed by Parklands Albury Wodonga in partnership with local community groups, including the Tallangatta Rail Trail Advisory Committee. The following sections of trail are open for off-road riding in our area and offer a unique rail trail experience suitable for all ages.